The book starts off with the main character living and being raised in a fishing town as part of a loving family life. Every year the water rises and the walls of the land must be strenghtened to keep it out. The book has a slow start and lacks clarity in the first two chapters. However after this it takes on a great twist, giving the book the life it needed through the start of a journey. 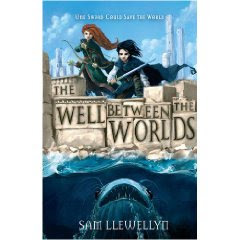 Here Sam begins to build a great fantasy world of Lyonese which gives this book a new outlook. I loved this section due to Idris setting out on a great adventure with a "mystery" person and finding a great friendship with Morgan. Sam adds some great ideas with lots of originality to keep the reader interested. This book has many elements including heroes, monsters and a good versus evil theme. It has been well written especially towards the end where the adventure and action has been well executed. It left me wanting to read the next book. Four out of five - only due to the slight stutter at the beginning. In Lyonesse, if you know how to swim, you must be a Cross -- a half-human, half-monster hybrid. When Idris Limpet survives drowning, he is condemned to death, but a hasty escape leads him to safety. Now he is going to become a monstergroom and care for the very eatures waiting to be killed for the land's fuel. He can't even imagine what destiny has in store for him. Sam Llewellyn was born on Tresco, Isles of Scilly, thirty miles west of Land's End, Britain's southwesternmost point, where his family has lived for 170 years. He was brought up between the coast road and the sea in North Norfolk. After the best education Britain could provide, he married the prizewinning Canadian children's author Karen Wallace, and went to live in Toronto. Here the evening yacht races in the harbour gave him new insights into the darkness of the human soul, and the freshwater vastnesses of Lake Huron sent him cruising up the lakeshore in a porous Ackroyd dinghy with a tent under the foredeck. After a few years on a rock in the lake, the Llewellyns had just about forgotten where Toronto was, and moved to the estuary of Ireland's Blackwater river, where for a short but exciting time they held the eel fishing concession. For the past twenty years they have lived in a medieval farmhouse in Herefordshire, England's wildest and most beautiful county, with their two sons, vast garden, and collection of boats in various states of disrepair. For several months most years, Llewellyn goes sailing to research his novels. He has sailed in most places from Turkey to the Baltic, in Maine, the West Indies, and the Pacific Northwest. In pursuit of fact and anecdote he has hunted pirates in the Philippines, crossed the Pacific in a rustbucket freighter, and rowed from North Wales to London, the rowing trip being the worst of the lot. For pleasure, he makes an annual trip to the West Coast of Scotland, where he cruises an open boat among the whales and mountains. I love the homage to the the original cover of Peter Benchley's Jaws on this book. Great stuff. It's nasty sea monster out of the book. It's good read you should read it if you get chance. Have you started writing book three yet? Yep, I'm about two-thirds of the way through C3, and have just had to write a synopsis for Macmillan to take to Bologna Book Fair. It's a slight deviation from the first two, so I'm having great fun with it. I hope you and Barry do me proud at this years Bologna Book Fair. I hope to go one year. It's also a great place to visit. Let me know any feedback you get.